Two months ago, we looked at how the campaigns for US Senate performed in 2016 compared to expectations. We are now turning our attention to the Presidential election. There have been more than a few pieces on what went wrong for Democrats – we have three so far – but typically these reflections focus on wins and losses. And while a win is the clearly ultimate goal for any campaign, that measurement is a limited view of what really happened. The “win or lose” mentality of analyzing races doesn’t prove whether a candidate ran a good political campaign or a poor one, if they spent money wisely, or if they squandered opportunities. With this approach in mind, we developed our PAAR (Percent Above Anticipated Result) model, which sets the level that a generic Republican and Democratic candidate “should” receive if running against each other. This model, based mainly on past election results, demographic changes, and incumbency, has proven to be highly accurate in both Senate and Presidential races. Indeed, the PAAR model typically shows that candidates have a tough time exceeding their PAAR score by more than 3 percentage points (within the margin of error in most polls) even though these numbers are determined more than a year out from the election and do not factor in specific candidates. PAAR also predicts results more accurately a year away from the election than many aggregators and prognosticators on the day before the election. It’s important to remember that context is key. While PAAR provides evidence that a candidate’s individual identity has less influence on their chances of winning than does their party association, 2016 was an exceptional year. Both major party candidates were extremely disliked, enough that we can see that influence in our PAAR results. For example, President Obama’s PAAR scores from 2012 balanced between -8.2 points to 8.5 points and Mitt Romney’s PAAR scores ranged from -10.6 points to 10.3 points. In contrast, Clinton’s PAAR scores ranged from -17.2 points to 2.9 points and Trump’s PAAR scores ranged between -19.2 points and 12.3 points; it’s safe to say that the uniqueness of this election cycle affected PAAR, even if by a diminutive amount. For this past year’s PAAR, we predicted that the Democrat would win on November 8, 2016. Since that was obviously not the case, in this memo, we will look back at our Presidential PAAR model to see where Clinton and Trump did better than expected and where they underperformed. We will try to gain a sense of why the election ended as it did, and why almost no one seemed to be able to predict the eventual outcome. When it comes to our PAAR scores, Clinton had an extremely rough night on November 8. She only overperformed expectations in three places: California, Washington, D.C., and Arizona. She received a negative PAAR score – meaning she underperformed expectations – everywhere else, even in the other 18 states she won. In comparison, Obama overperformed in 24 states in 2012, matched expectations in 1 state, and underperformed in 26 - including 8 states where he won. Not only were the overperformances few and far between for Clinton, but these few instances of overperforming didn’t affect any outcomes. She won California and Washington, D.C. by 30 and 87 percentage points, respectively; she also received a PAAR score of 3.9 points in California and 1.1 points in Washington, D.C. The fact that she overperformed in both places did not influence the fact that she won in these two places anyway; she was going to win there regardless. Arizona is slightly more interesting, considering Clinton lost the state to Trump by 4 points (49% to 45%). While she received a positive PAAR score in the Copper State (0.1 points), Trump actually received a decently negative PAAR score (-6.3 points). Another interesting facet of this small accomplishment is that, with all the talk about Clinton failing to garner votes in many districts that voted for Obama in 2012, Clinton did better in Arizona overall than Obama did in the last election cycle (he received a PAAR score of -1.2 points in 2012). Not surprisingly, given the ultimate result of the election, the Trump campaign had a much better night. He had a positive PAAR score in 26 states including 5 states where he lost, and a negative score in 25 states and Washington, D.C. In the states where he overperformed, he did so by an average of 3.05 points; in the states where he underperformed, it was by an average of -4.15 points. Interestingly, the state where Trump had the lowest PAAR score was in Utah, where he underperformed expectations by 19.2 points. While most of Trump’s positive scores reflect stronger wins in deeply red states and swing states he managed to pull in his direction, he did overperform PAAR expectations in four blue states that Clinton still won. Trump performed better than expected in Delaware (3.1 points), Maine (2.9 points), and Hawaii (1.4 points), and by smaller margins in Rhode Island (0.4 points) and New Hampshire (0.3 points). It’s interesting to point out that Trump performed much better in these states than Romney did in 2012, as Romney received all negative PAAR scores in these 5 places; not many would have guessed that the more divisive candidate would have performed better in some blue states. And, in what surprised many on Election Night, these races ended up being much closer than expected in states like Maine. Many here in Washington – including us – have focused our retroactive election analysis on areas that flipped from voting for Obama to voting for Trump and how Clinton’s loss of those counties and districts contributed greatly to Trump’s victory speech in the wee hours of November 9th. Overall, Clinton lost six states to Trump that voted for Obama in 2012: Florida, Pennsylvania, Ohio, Wisconsin, Michigan, and Iowa. While Florida, Ohio, and Iowa had shown much closer races, the loss of the three other swing states – Pennsylvania, Wisconsin, and Michigan – came as more of a shock, mostly because Democrats considered these relatively safe electoral votes. This probably had something to do with the fact that Pennsylvania and Michigan hadn’t elected a Republican to the White House since 1988; Wisconsin had not done so since 1984. In Pennsylvania and Michigan, both Clinton and Obama underperformed PAAR expectations. In the Keystone State, Clinton scored -5.9 points while Obama scored -1.4 points and in the Great Lake State, Clinton scored -7.6 points compared to Obama’s score of -0.2 points. In 2012, Obama was expected to receive 53.4% of the vote in Pennsylvania and 54.4% of the vote in Michigan. These numbers shifted to an expectation of 53.8% and 54.9% respectively for the Democratic candidate in 2016. Four years ago Obama’s inability to meet expectations were noteworthy, but did not have any effect on the outcomes. Four years later, there was clearly a different story in the end. Trump, on the other hand, was able to best expectations by 2.4 points in both Pennsylvania and Michigan. Four years ago, Romney underperformed in Michigan by 0.9 points and met expectations in Pennsylvania (46.6%). In Wisconsin, Obama carried a positive PAAR score, just above expectations (0.1 points), but Clinton performed poorly, receiving a PAAR score of -7.2 points. We analyzed these significant losses in our post-election piece What Happened? Part II, where you can see district-by-district breakdowns of where exactly in key swing states Clinton lost Obama voters. Unlike in Pennsylvania and Michigan, where Trump solidly overperformed expectations, it was much more about Clinton losing than Trump winning in the Badger state. In the end, Trump only exceeded expectations by 0.9 points. In North Carolina, the one swing state that stayed in Republican hands, both candidates underperformed expectations. Clinton was expected to win 49.8% of the vote in the Tar Heel State but only managed to win 46.2%, a PAAR score of -3.6 points. Trump also under performed but by a much smaller margin (just 0.4 points). This was a much different story four years ago where Obama overperformed expectations by 1.8 points, although clearly it was not enough for him to repeat a win in North Carolina. The swing state that seems to get the least attention in post-election analysis is Iowa. Our guess is this is because the results was not unexpected given the polls coming out of the state throughout the general election. Trump ended up winning the state by almost 10 points, although ended up just a point or so over the 50% threshold (51.1%). His overperformance in Iowa (4.4 points) was by far his best result. To add insult to injury, this was also the largest underperformance for Clinton, coming in 11.6 points under expectations. Four years ago, Obama overperformed expectations by 0.7 points and Romney underperformed by 2.5 points in the Hawkeye State. This is clearly a dramatic swing, which now begs the question: is Iowa no longer a swing state, or were these results candidate-specific? Outside of Trump winning seven of the swing states, there was something interesting happening in these states when it comes to the volatility. In 2012, the absolute average of Obama’s PAAR scores was 0.76 points. Four years later, it was 5.84 points for Clinton. In other words, the swing states performed almost exactly as expected in 2012, but this was not the case four years later. It should also be noted that Obama underperformed in just 4 of the states, while Clinton underperformed in all 11. Trump, on the other hand, overperformed in 6 and underperformed in 5. In comparison, Romney under performed in 10 out of 11 and matched expectations in 1 state. Back when the Clinton campaign was more confident in its chances of success, there was a lot of talk about Clinton possibly carrying other states such as Georgia and Arizona – states that would have been referred to as “expansion” states had she won them, considering they have voted for Republicans candidates for decades. Some people even suggested that Clinton was putting Texas in play. However, as one may have expected, Trump carried all the deeply red states and Clinton carried all the states designated as deeply blue. Even though Clinton claimed victory in the deep blue states, she still underperformed expectations – sometimes by double digits. The only two deeply blue areas she overperformed with PAAR were California and Washington, D.C., as we mentioned before, and she only slightly underperformed in New Jersey (-0.9 points), Maryland (-1.1 points), Massachusetts (-2.6 points), and New York (-2.9%). In the remaining blue states, she received a PAAR score of -3.6 points or worse. Though she underperformed across the board, Clinton didn’t have much to worry about with this group of states. Clinton won every blue state by 11 percentage points or more, with the exceptions of Maine (2.9 percentage points), New Mexico (8.3 percentage points), and Minnesota (1.5 percentage points). For example, even though she underperformed in Vermont by double digits (-10.6 points), she still won on election night by 27 points (57% to 30%). In comparison, Obama received just four negative PAAR scores in deeply blue states (NM, OR, IL, MA) compared to fifteen negative scores for Clinton. Trump even performed better in this group than Clinton did, receiving positive PAAR scores in four states (ME, HI, DE, RI). In the 21 states that both Clinton and Obama won, Clinton performed significantly worse than her predecessor. She only managed to outperform Obama in two states: California (by 0.5 points) and Massachusetts (they both received a PAAR score of -2.6 points). In every other state within this category, Clinton underperformed Obama’s PAAR score by 2.1 points or more. In five of these states, Clinton underperformed Obama’s 2012 PAAR scores by double digits; they were Rhode Island (she underperformed Obama by 10 percentage points), Delaware (10.4 points), Hawaii (17.7 points), Maine (10.9 points), and Vermont (14 points). Clinton expectedly performed much worse in deep red states, underperforming by double digits in seven of them. Trump had a much easier time performing above PAAR’s expectations, receiving negative PAAR scores in just six of the twenty designated red states (ID, UT, KS, AK, LA, TX). However, with the exception of Alaska, Clinton also received negative PAAR scores for these states, which all but canceled out Trump’s underperformance. Additionally, the main reason for his underperformance in Utah can be tied to Independent presidential candidate Evan McMullin’s popularity there. As far as comparing Clinton’s performance to Obama’s among these states, Clinton fared far worse than Obama. While Obama’s scores ranged from -8.2 points to 1.9 points, Clintons fell far below, ranging from -17.2 points to -1.0 point. Even though PAAR predicted she would lose all of these states, Clinton certainly performed lower than PAAR’s expectations. Like Clinton, Trump underperformed in some unexpected places; it just didn’t happen as often. Of the 20 solidly red states, Trump received a positive PAAR score in 14 of them – compared to Clinton, who we already mentioned only managed to receive a positive score in 2 of the 16 solidly blue states. His results were pretty evenly split, as we mentioned earlier – he received 26 positive PAAR scores and 25 negatives scores. Excluding North Carolina, as the Tar Heel State has become solidly purple, there were 7 states that Trump won – and are also decidedly red – where Trump underperformed expectations. We already mentioned that Trump received his worst PAAR score in Utah (-19.2 points) and that he also received a negative score in Arizona (-6.3 points). In addition to these two, he also underperformed in 5 other red states: Louisiana (-0.8 points), Kansas (-1.5 points), Idaho (-3.4 points), Texas (-3.6 points), and Alaska (-8.5 points). Beyond these states, Trump overperformed in every other red state, ranging from a PAAR score of 0.3 points in Mississippi to 12.3 points West Virginia. Similar to how Clinton’s underperformance didn’t affect her victories in blue states, Trump’s PAAR scores had no real effect on the outcomes in red states on Election Night. This is because he won by double digits in every red state with the exception of – surprisingly – Texas, where he won by just 9 points. While he received a negative PAAR score there, Clinton also received a negative PAAR score and the margin wasn’t near enough to tip the state to Clinton’s favor. When you remove the Lone Star State from the list of red states, Trump won by margins ranging from 14.7 percentage points to 42.1 points. Comparing Trump with his Republican predecessor, Trump fared much better. In 2012, Mitt Romney received just 14 positive PAAR scores overall. These positive scores coincided with positive scores for Trump as well, with the exception of four states: Louisiana, where Romney overperformed by double digits (10.3 points) but Trump underperformed by -0.8 points, Kansas (0.3 points for Romney, -1.5 points for Trump), Massachusetts (0.8 points for Romney, -4.6 points), and Utah (3.9 points for Romney, -19.2 points for Trump). We talked about the dynamic in Utah so these results are not surprising, as for Massachusetts, being governor clearly did not hurt Romney. Although he claimed victory in zero blue states, Trump had a better night regarding PAAR scores than both his opponent and his Republican predecessor. Out of the 16 solidly blue states, Trump received a positive PAAR score in 3 of them (DE, HI, RI); Clinton received 2 positive PAAR scores (DC, CA) and Romney achieved just one single positive score (MA). Trump also outperformed Romney in more than half of these blue states – Rhode Island, New York, New Jersey, Illinois, Connecticut, Delaware, New Mexico, Hawaii, and Vermont. Romney had a slightly less awful time on the west coast (CA, OR, WA, NM) and also held up better in Illinois, Massachusetts, and Washington, DC. Even though Trump didn’t win these states, these trends still illustrate the overall theme of election night: Clinton did significantly worse than expected, while Trump exceeded expectations, even if only by a little. When we look at the PAAR averages of our most recent presidential candidates along with the candidates before them, one pattern is very clear. These averages nearly flip-flopped; Obama had two positive averages in the Base Dem and Swing states and received an expected negative average in Base Republican states. Trump surprisingly ended up in the exact same situation with the exact same averages. On the losing side, Romney received two negative averages for the Base Dem and Swing states, with a slightly positive score for Base Rep States. In 2016, Clinton received negative averages across the board that were also significantly worse than Romney’s averages in 2012. Essentially, Trump performed closer to Obama in 2012, while Clinton performed even worse than Romney. 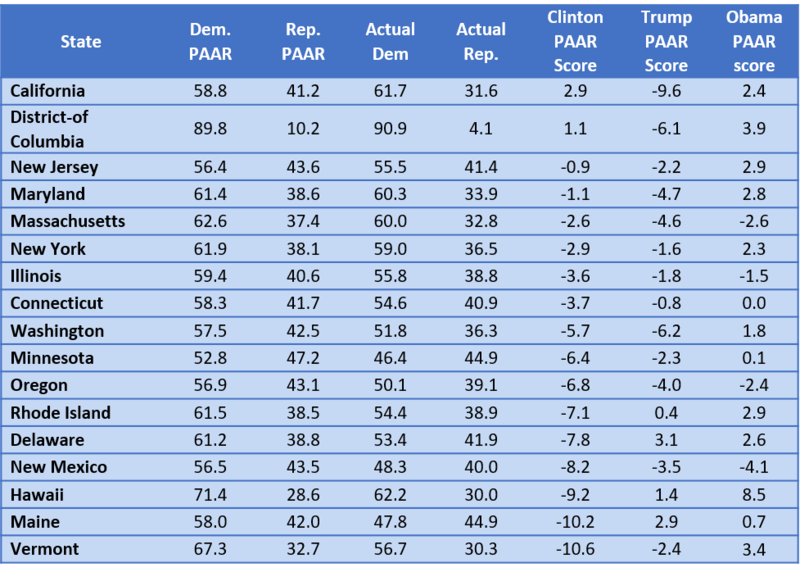 Among other reasons, these PAAR scores and their averages highlight how Trump won on November 8th and just how badly the Clinton campaign suffered. As we have been saying over the last few years, analyzing a political campaign through the “win or lose” prism doesn’t give the whole picture. Additionally, losing by 3 points in a red state like Utah and winning by 3 points in a blue state like Massachusetts are two entirely different situations for Democrats. For example, Clinton lost Georgia by 5 points and North Carolina by just 3.6 points; this signals that these states may be evolving to more hospitable environments for Democrats. But the fact that she only won Minnesota by 1.5 points – a state that hasn’t voted for a Republican since 1972, which was the year Richard Nixon carried every state but Massachusetts and D.C. – says a lot about where states around the Great Lakes may be headed in the future. And sure, Clinton won all those blue states – but she still vastly underperformed expectations, pointing to something certainly missing in her campaign strategy. There is a lot of talk about how the campaign neglected areas in key states as a result of overconfidence, and research might show the effects of the campaign’s money spending choices in these areas. While many factors probably contributed to her loss – misogyny, "whitelash", and apparently Russia, to name a few – the Clinton campaign glossing over key parts of the electorate was definitely a major reason. We can talk all we want about the war within the GOP, but the Democratic Party also has a lot of division and issues it needs to deal with in upcoming years. If the Democrats want to take back the White House in 2020, or the Senate, or the House, they cannot make the same mistakes made by their 2016 presidential candidate.